Used for a wide variety of applications and industries, Self-Framing metal buildings are a cost effective solution for smaller building packages. Self-Framed metal buildings are structurally supported by a roll formed roof and wall panel with a 3″ or 4-1/2″ rib depending on size and span of the structure. Subject to customer requirements, self-framed metal buildings can be yard erected on a steel skid base, or the building materials can be packaged and shipped to site for field construction. With over 40 years constructing custom Self-Framed metal buildings, MakLoc’s experienced team is comfortable working with customers in all stages of the design process. Whether you have a complete and honed design, or a basic sketch of your building layout. MakLoc will ensure functional project requirements are met, with budget, delivery and uncompromised quality in mind. 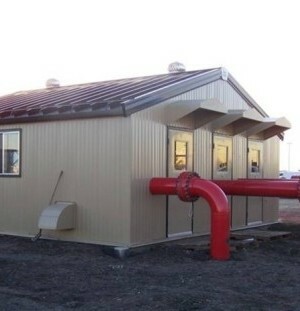 All of our self-framed metal buildings meet Canadian National Provincial building codes, and come complete with necessary professional engineered stamped drawings. Also, our design and drafting team works with a variety of drafting applications (Inventor 3D, AutoCAD, and Tekla) depending on project requirements. The above noted applications are just a short list of the potential functions of a Self-Framed metal building. Start your request now at our Request a Quote page, or contact us to discuss the scope of your project, and we would be happy to help you. Need a building now? MakLoc’s Fast Track program is a commitment to deliver a Self Frame metal building in 4 weeks or less from receipt of order. The program is intended for low to medium complexity buildings over a broad range of sizes. Check out the Fast Track design criteria to learn more. Subject to customer requirements, Self-Framed metal buildings can be yard erected on a steel skid base, or the building materials can be packaged and shipped to site for field construction.